A little 2-player game came on the market recently and had been getting some good reviews. More importantly, it had been compared again and again to Lost Cities, one of my absolute favourite card games and possibly the best 2-player card game out there. I am happy to say that Sebastien Pauchon's Jaipur from the Gameworks line is as good as and, depending on your tastes, perhaps even a little better than LC. Here's why. The cards and pieces are of a high quality and I have no complaints. The game is simple so there isn't that much needed but the cards are still nice and colourful and do the trick. The rules themselves are easy to follow and very well-written. There are a few little details that one needs to remember like having to take ALL camels and hand limits and such but they are all laid out clearly. After a couple rounds, you shouldn't have to refer to the rules again. Verdict: High-quality and very usable. Excellent. So what do you do? In a nutshell, you are trading to get sets of cards which you trade for corresponding tokens. For example, discarding three gold cards gets you three gold tokens. Simple. 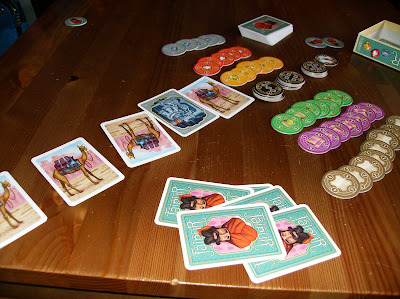 On your turn, from the market you can either draw a coloured goods card, take all the camels on display, or trade two or more goods for goods in your hand and/or camels. Or instead you can trade in a set of the same coloured cards for that many tokens of the corresponding colour. It's all pretty simple but a few things complicate it. For most goods, the first tokens taken are worth more, often significantly, than the later tokens of that colour. There are bonus tokens for trading in three or more of a set, larger sets being worth more points. 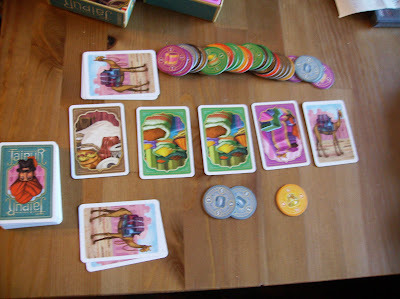 You have a hand limit of seven cards, not including camels, and there is a bonus 5 points at the end to the person with most camels. All these little details turn a simple game into a surprisingly strategic little hand of cards. It's not deep but it's definitely tactical and requires at lease a couple of neurons firing. You need to watch your timing for taking early high-valued tokens and you also need to be careful not to let too many cards be revealed in the market for your opponent. Definitely not brain-burning but thoughtful nonetheless. Verdict: Fun but tactical. Trickier than it looks. Great. As I said, this game is very good. In fact, I think it's just great. It has a back-and-forth feel like Lost Cities but a lot less of the headache that goes along with it. It does miss the planning aspect of Lost Cities but I think Jaipur actually makes up for it by being even more fun to play and easier to score at the end of a round. If you like simple, 2-player card games that are lightning-fast and full of some thoughtful decisions, then this one is for you. I think it's just fantastic. Seriously, Chris, it's quite the great little game. Simple, quick, and surprisingly fun. I feel like Jaipur is flying under most people's radar, so I'm glad you found it and have enjoyed it! hey Eric.. I was thinking of getting ingenious.. but the travel edition is all handy and cheap... how often do you really play it with more than two people? Do you think it's worth double the price to be able to play with 3 and four players?